One of the joys that I get every Christmas is shopping for my kids. I love finding just the right toys for them – toys that are on their list to Santa, and some that aren’t but that I know they’ll love just the same. 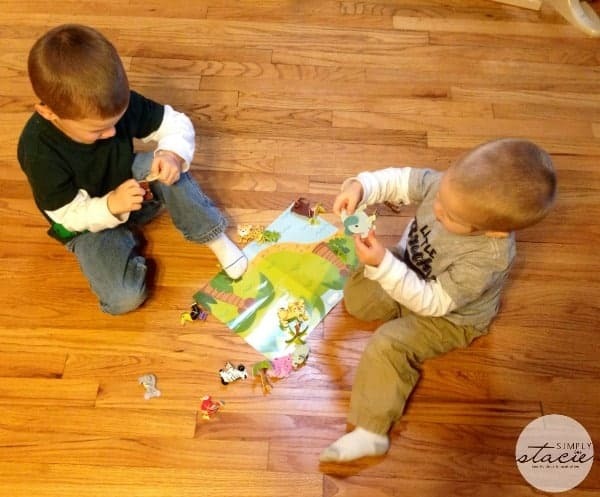 I’m always looking for new and fresh toy ideas that are fun and engaging for both of my boys – bonus if they can play with them together! I’ve already gotten a lot of my holiday shopping done for this Christmas but have had my eyes open for little trinket gifts for their stockings – and I found a great new source for just that in Manhattan Toy. I received four sets of toys from Manhattan Toy’s imagine i CAN line for review. Each one was small enough to throw in an overnight bag for traveling, yet engaging enough to keep both my boys busy for hours at a time. * imagine i CAN Farm Fun Minis Play Set – this set is so well made, I couldn’t believe it costs only $6! 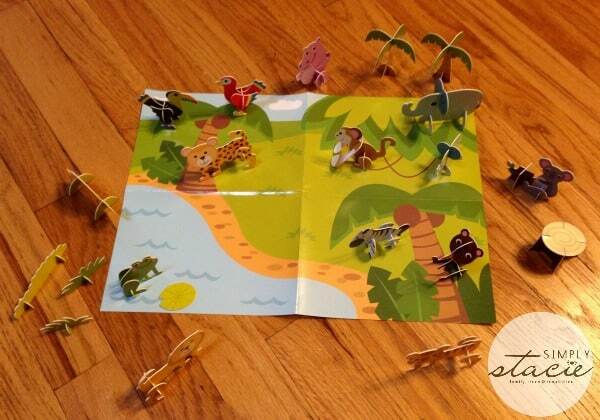 There are 18 3D animal and scenery pieces to this set that are bright and sturdy, and held up quite well with both my boys playing with them. It was great to see my boys interacting with the scene and making up little stories about the animals. This is a great set for the animal-loving toddler in your life. * imagine i CAN Jungle Fun Minis Play Set – same specifications as the farm set, same great price. It was great to have both the farm and jungle sets – my boys really enjoyed both. 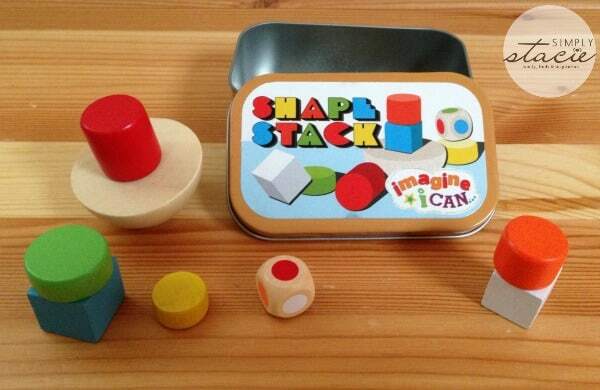 * imagine i CAN Shape Stack – this one is also at the incredibly low price of only $6. 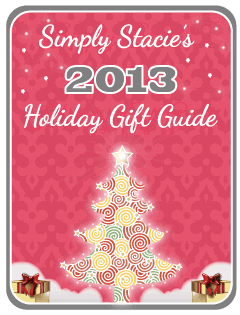 A great stocking stuffer, and easy to travel with game. The object of this two-person game is to stack the blocks as high as you can on the wobbly sphere base, using the colors you roll on the die, before it falls. My oldest loved the challenge of this game, and my little guy loved when it would fall! * imagine i CAN Lace & Play Lion – I chose this piece to help my oldest son with his fine motor skills. This set is great for hand-eye coordination and it’s a cute piece to hang up when it’s complete. It also gave my son a great sense of accomplishment to have created this piece on his own. The Lace & Play sets sell for only $5 on the Manhattan Toy site. Manhattan Toy has won accolades and awards for their imagine i CAN line of toys. They offer consumers over a dozen affordably priced activities for children. 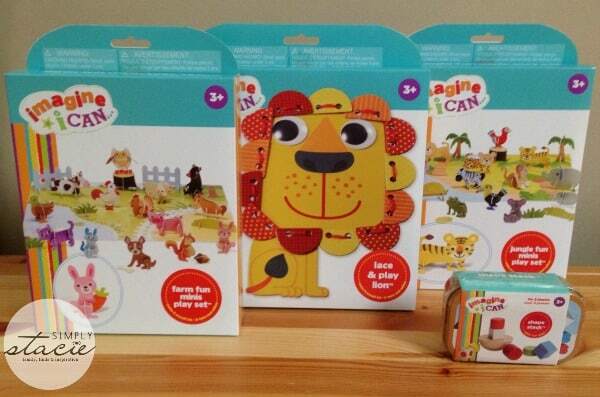 The imagine i CAN line includes themed kits ranging from mini play sets to arts and crafts activities. Manhattan Toy is committed to craftsmanship, quality, and creativity and offer more than 700 exclusive, original product designs distributed worldwide through more than 10,000 fine department and specialty toy and gift retailers. To see all that Manhattan Toy has to offer, visit their website. I like the Baby Stella Sweet Sounds Doll. 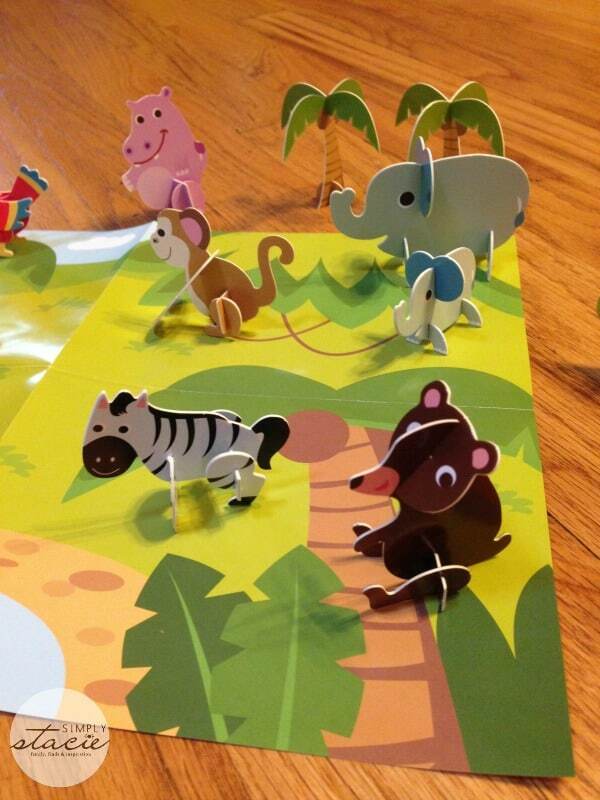 I love the Imagine I Can line- great activities to take to doctors offices or restaurants. I love the Groovy Girls Chic-a-delic Chaise. thank you for the wonderful giveaway! I would love the Groovy Girls Cheftastic Girl Size Apron Set. I like the Groovy Girls dress up outfits. Especially the mermaid. I like the Whoozit Starz Lights & Sounds. Thanks. I love the Dr. Seuss THE CAT IN THE HAT Stacker. Cute! I like the Imagine I Can Knitting Beginnings. I like the Groovy Girls Belisima Ballerina doll for my granddaughter. baby stella sweet sounds doll looks so cute! I love the Snuggle Pods Lil’ Peanut. i love the Theater Stage to put on puppet shows! I think my kids would love the lace and play sea creatures or the eel and angler fish puppets, very neat toys, definitely don’t see these in fargo! Thanks for the giveaway! I like the Pull along friend Peacock! The Grinch finger puppets are adorable. I like the create and play patterned blocks. thank you for the opportunity to win! I really like the Imagine I Can Crafty Eraser Creations set. I like Groovy Girls Princess Seraphina.